Companies such as Google and Amazon and other organisations that use aggressive tax-avoidance schemes will incur a tax charge of 25%, as the government goes after their UK profits. In his Autumn Statement, chancellor of the exchequer George Osborne said tax avoidance was not fair for British firms. "We will make sure the big multinationals – including those in the tech sector – pay 25% tax on the profit from economic activity in the UK." ‎Julian David, CEO of techUK said: It is clear that over many years global corporate tax rules have become outdated, complex and opaque. The way to remedy this is not through unilateral action – but through international co-operation to make rules simpler and more transparent. Osborne also announced funding for lending, tax breaks for entrepreneurs and increased R&D tax credit for small and large businesses. In June 2014 the government unveiled 40 employer-designed apprenticeships, including six digital industry standards. To boost apprenticeship schemes, the chancellor said he would make it cheaper to employ young people. From April 2016, employers will not have to pay National Insurance contributions (NICs) for all but the highest earning apprentices aged under 25. 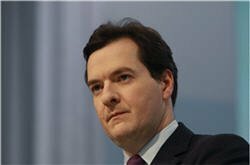 On the skills front, Osborne said: "Scientific advances are crucial to our economic future." Osborne unveiled postgraduate loans – available from 2016 – for people aged under 30. As part of the Autumn Statement, the government released National Infrastructure Plan 2014 which outlined how 70% of rail passengers will be offered high-speed broadband on trains by 2019. The plan touched on how to support poor mobile data and voice communications. The report stated: "Some areas of the UK do not get good quality mobile coverage, or do not get any coverage at all. Good mobile coverage helps businesses to grow and people to stay in touch, which can be very important for people who are vulnerable or isolated. The government is therefore investing to improve the quality and coverage of mobile phone voice and data services." "As the number of internet users and global connected devices increase, estimates suggest the availability and take-up of faster broadband speeds will add about £17bn to the UK’s Gross Value Added by 2024, as a result of enhanced productivity, more uptake in the labour force and flexibility in working practices, such as the ability to telework," the plan stated. In June 2014 the chancellor called for a dialogue on boosting the UK’s regional economy, by constructing Britain’s third high-speed rail line between Manchester and Leeds, drawing mixed reactions from the technology community. He reiterated this in the Autumn Statement, and said the government would build a "Northern powerhouse". The chancellor also said that £2bn from cost savings will be diverted to the NHS front line, while GP services will get a boost of £1.2bn from the fines paid to the financial regulators by the banks following the banking crisis. Alasdair McCormick, director at Ricoh, called for the government to match its investment in front-line services at the NHS with technology investment. He said: “The government must ensure that newly digitised information can be readily accessed by professionals at any time, from any location.